Florida seems high. In fact, aside from the top four, it’s kind of like the whole Top 25 was ranked without anybody actually watching them play. Enough grousing. 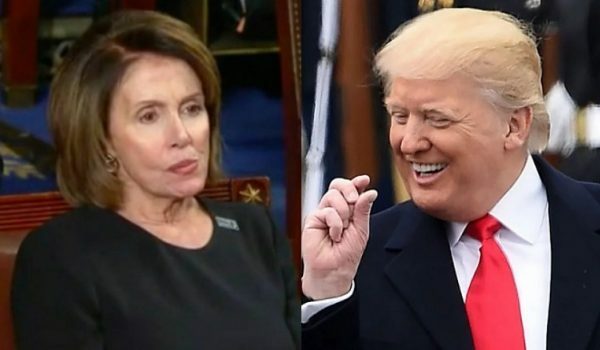 On to the wailing and gnashing of teeth. Consider it done, regarding Virginia Tech’s unseemly (really unseemly) loss to Georgia Tech in their Storied Rivalry match Thursday night. Woe. That’s all we’re saying about that. Toledo, we are happy to say, is once again a bright spot on the landscape, having thumped Western Michigan decisively on Thursday. Epic 3Q and total dominance on the ground. The Rocket secondary still has work to do, but a gratifying performance overall. The University of Tulsa, which beat Notre Dame 28-27 on 30 October 2010, hosts AAC West opponent Tulane on Saturday in a battle for the bottom. TU, in full-frontal rebuilding mode, is at 1-6 (0-3 conference) to Tulane’s 1-2 (2-5). Tulsa gives 2, which is not unreasonable. Oklahoma, sporting a new #8, hosts our very own Kansas State Saturday afternoon, which comes in 3-4 (1-3 Big 12) and all feisty off the win over OK-State. The Sooners are giving 24.5, but we all know these Big 12 matches can go sideways on a dime, especially if they involve Oklahoma, Kansas State, Oklahoma State, Texas, Iowa State, TCU, Texas Tech, or West Virginia, pride of the Big 12. Notice that at this time, we are leaving Kansas (motto: “What difference, at this point, does it make?”) and Baylor out of that reckoning. 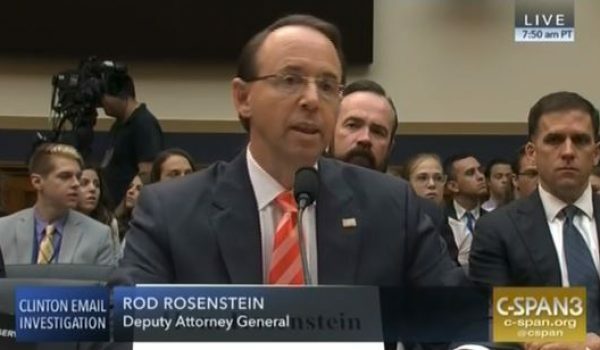 So it’s not, you know, everybody. Oklahoma State hasn’t been having its finest hour for several weeks now, and has to host #6 Texas in the marquee match on Saturday evening. We’re dubious about that #6, and don’t doubt that the Cowboys can beat the ‘Horns. Texas QB Sam Ehlinger has been developing into a significant positive for them, but is coming off a sprained shoulder, possibly a boon for the unstellar, mid-pack OSU secondary. Texas gives 3. Gundy’s still got the tonsorial edge. Navy takes on #3 Notre Dame for their Massively Storied Rivalry series, also Saturday evening but over on CBS, in San Diego County Credit Union Stadium (formerly Qualcomm) in San Diego. We’d love to think the Mids have a chance in this one. Arsh are favored by 24. Army, healthy at 5-2, is off to take on MAC’s 4-4 Eastern Michigan, with the Eagles giving 1. Air Force hosts the big one, Boise State, on Saturday evening, on the wrong side of 9.5. We won’t jinx anything by giving advice on points. Nevada brings up the FBS rear Saturday night, hosting MWC West’s San Diego State, which heads to Mackay Stadium 6-1, tied with Fresno State for the division lead, and giving 2.5 because of a couple of near-misses along the approach vector. We’re kind of feeling this one for the Aztecs, but the 4-4 Wolf Pack did blow everyone out of the water by knocking off Hawaii in Hono last week, 40-22, so we’re not despairing, by any means. LSU is now #4, a ranking we can conditionally support (and one that pleases us no end). Since the Tigers have the weekend off, and will be preparing for the all-important meet with Alabama on 3 November, we’ll hold further comments in abeyance. TCU hit a rough patch with Texas Tech and the Sooners, but heads to Kansas on Saturday giving 13.5. With K-State, West Virginia, and OK-State left to play, a bowl bid isn’t a sure thing for the 3-4 Frogs this year, but they’re still in the running. 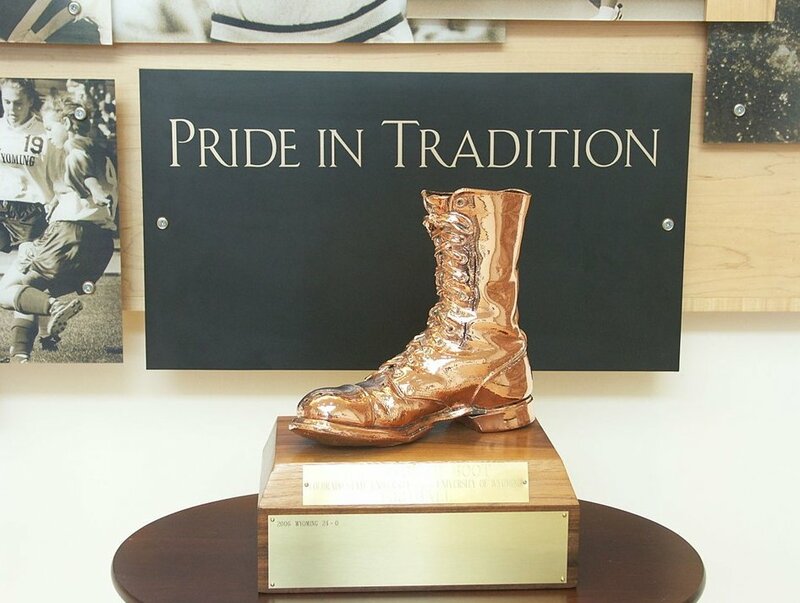 Wyoming is at Colorado State this evening (Friday) in the Storied Rivalry battle for the Bronze Boot, which we love because it’s an actual, no-kidding bronzed combat boot, donated by a Colorado State ROTC instructor. Plus there’s a thing with ROTC units meeting at the “border” (state line) to hand items off and tote them around after suitable blessings from school dignitaries. With the kickoff moments away as I type, the Pokes are donating 3. It looks like Wyoming did a nice job on defense last week (no game broadcast here), and favored Utah State had to eke out a 24-16 win with special teams. Coming in 2-6, Wyoming needs this one, but the balance of the schedule leaves hope for a 6-6 finale. Cowboy up! #1 Alabama has the week off. #2 Clemson is at Florida State giving 17. ‘Ware the ‘Nole, dudes. #5 Michigan is also off. 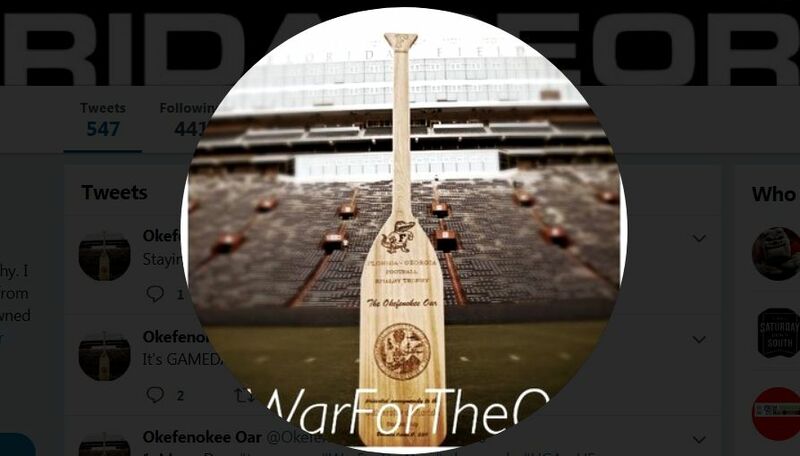 #7 Georgia hosts #9 Florida in Jacksonville, the traditional location of their spectacularly timed Storied Rivalry for the Okefenokee Oar, which we consider a very fine game trophy and not at all overly obvious, as those victory bells can be that haunt the rivalry landscape like cheap mementoes from Tijuana. If you’re #7 and #9 (at least this week), you might as well play the weekend of the first CFP ranking. As befits a Storied Rivalry, the Bulldog give is a meager 1. #10 Central Florida is off, and will host Temple Thursday night (1 November). Outside of the nosebleed section, we’re not long on Storied Rivalries this week. But North Carolina will be at Virginia for the South’s Oldest Rivalry (1892), which is tastefully played without any tacky statuettes or other prizes mounted on wood. In a sudden move, the Yahoos are giving 8.5. If you like your football old school, #17 Iowa at #18 Penn State (-6) looks promising. For a chaotic throwing-it-around-to-see-what-sticks match, Texas Tech at Iowa State tees up a battle of the Big 12’s most consistent spoilers on Saturday morning, and is likely to be fun. We don’t rule out #20 Wisconsin (-4) at Northwestern. Likewise, we’re not recommending #21 South Florida at Houston, exactly, or #14 Washington State at #24 Stanford (pause for ironic reflection here), but you might stumble into some good football either way. Cougars (Houston variety) and Candy Pink give 7.5 and 2.5, respectively. Bethune-Cookman is playing Nebraska, for some reason, which we feel we should mention. In FCS, McNeese State plunged to #16 after the 25-17 drubbing by Incarnate Word. The Cowboys get right back on the horse to host tough opponent Central Arkansas on Saturday evening. The Bears are 5-2, ranked #14, and currently atop the Southland Conference standings. Should be a spectacular clear and 72-ish for the 6 PM game start in Lake Charles. In Div II, Slippery Rock, 7-1 after a solid 28-13 over Clarion, faces California (PA) on Saturday afternoon. SRU is up to 42 votes in the Coaches Poll, and could break the Top 25 with a convincing win at a major PSAC rival. The 5-3 Vulcans are a step off their usual pace, but did prevail over Indiana (PA) early in the season. With IUP at #22 now and edging back from obscurity, the Rock has the chance for a quality win here. Expect festive football conditions, with rain and upper 40s at 1 PM for the kickoff. 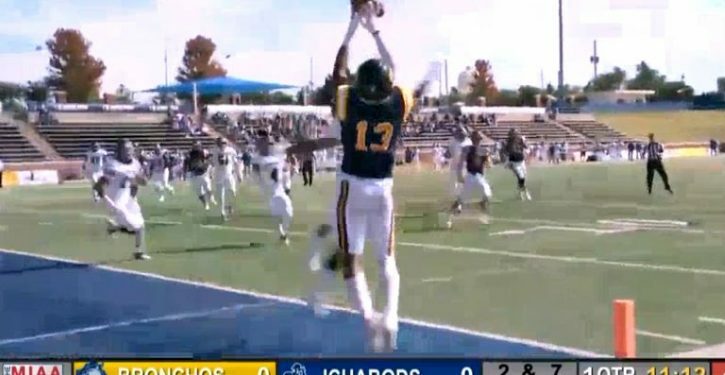 UCO blistered Washburn’s behind last week 34-0, and heads off with a fine 5-3 balance sheet to take on Missouri Southern in Saturday in Joplin (motto: Serving Interstate 44 Since 1962). Missouri Southern is 1-7, but they did get their first win last week. Right around 70 and sunny for the 2 PM kickoff. 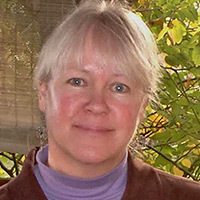 In Div III, Rose-Hulman slaughtered Anderson U. (IN) 44-6 last week, to surge to a 3-2 conference record (3-4 overall) and climb out of the cellar. They’ll be at Defiance College (OH) on Saturday afternoon for a clash with the 0-7 Hornets, who boast a grand total of 81 points on the season. So you can kind of see how that’s going. Game start at 1:30 PM; mid-40s with rain on the menu. Christopher Newport, 4-2, thumped William Paterson on the road last week 39-10, and has the pleasure of hosting Kean University (Union, NJ) on Saturday in Pomoco. Kean is 1-6, with its one victory over William Paterson. We never tire of pointing out that Richie Sambora is a Kean alum, but it may be more important that pro wrestler Crowbar (Christopher Ford) also rejoices in that affiliation. Cloudy and 50s for an afternoon game starting at 1 PM. Merchant Marine staged a huge second-half comeback to knock off Worcester Poly 25-24 last week and hit this week at 6-1. The Mariners are off Saturday, with two games left, at Catholic U. next week and the big finish hosting rival Coast Guard on 10 November.